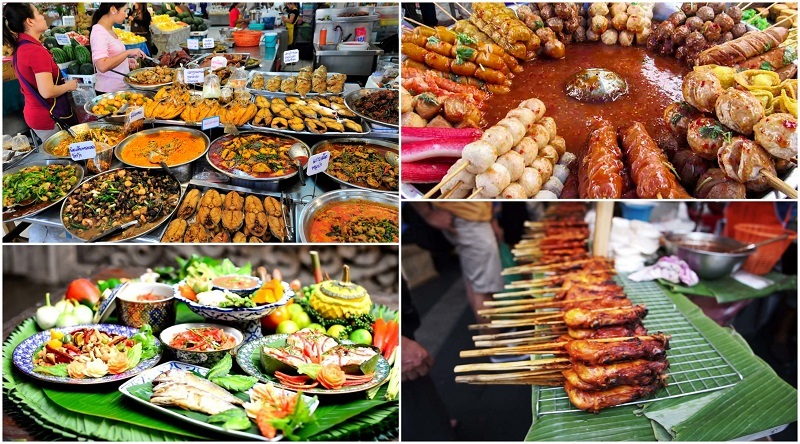 There is no doubt about it, Thai people love to eat and they love their traditional street food most of all. They’ve definitely earned the right to be proud of their dishes, as their cuisine is one of the most delicious and diverse in the world. Every Thai cook strives to find the perfect balance of salty, sweet, sour, spicy, and bitter flavors in all their food, although to the foreign tongue the ‘spicy’ may be the most noticeable! While you can find Thai restaurants all over the world, eating traditional street food in their country of origin is a totally different experience. The flavors are stronger, the ingredients are fresher, and there are a much wider variety of dishes and tastes to choose from. Here are the 25 best Thai street food to look out for when you visit the markets or local restaurants in Thailand. Note: This list does NOT include Pad Thai. Come on, try something new! This spicy northern Thai specialty features fresh egg noodles and chicken or beef in a rich, hot broth of coconut, herbs and spices, and topped with crispy wonton noodles. It’s also served with pickled cabbage, red onion, and lime, which you can add to your taste. Let’s just say it’s the most popular northern Thai dish for this reason: it’s unbelievably delicious. Until you watch someone cook a Thai omelet, you’ll probably continue to think that all omelets are healthy—but not in Thailand! The delicious, naughty secret of the Thai omelet is that it’s literally deep-fried in vegetable oil, and emerges as an oily, crispy, salty, mouth-watering eggy eruption. This tasty Thai favorite can be enjoyed in pretty much any restaurant or stall that serves rice, and is usually eaten with sweet ketchup or chili sauce. Although Thai cuisine has become super popular internationally, there is at least one Thai food that may never be adopted by other cultures. Typically fried in pepper and soy or fish sauce, crickets, worms, and grasshoppers are usually eaten as a snack in the afternoon, or paired with beer or liquor as a crunchy and crispy night time treat. Poo Pad Pong Karee is like the delectable Thai lovechild of an Indian and Chinese affair of flavors. Onions, tomatoes, peppers, and crab are sautéed in an aromatic Thai yellow curry paste, and then eggs are cracked into the mix, which makes the whole concoction creamy, fluffy, and thick. To top off this unique dish, parsley and green onions are sprinkled on as garnishes. Just as a warning, this dish is sometimes erroneously translated as “fried crap curry” on Thai menus—don’t let it put you off! The heartiest of Thailand’s noodle dishes, Pad-Se-Ew will keep you full all day long. This scrumptious dish features thick rice noodles, which are fried up with garlic, pork or chicken, broccoli, an egg, and a generous amount of the dark soy sauce that the dish is named after. Eat like a local and put the finishing touches on the dish yourself by adding a spoonful of chili flakes, lime, vinegar, or sugar. Pad Se Ew’s savory, filling quality makes it the perfect meal to take home with you after a night out as well! Nam prik ka phi is a simple northeastern specialty consisting of a plate of mixed steamed vegetables and fish (usually whole). To eat it, you individually dunk each piece of fish and vegetable in a fermented shrimp paste/chili sauce. A simple, healthy, and traditional choice, Nam Prik Ka Phi can be livened up as much as you like or not at all depending on how much of the pungent sauce you use. Especially recommended for lovers of all things fishy. Tom kha gai is a creamy, sweet, and slightly tangy thai soup that combines coconut milk, lemongrass, shallots, galangal, chicken, and sometimes additional vegetables. This soup is super flavorful, without being quite as spicy or sour as its in your face sister: Tom Yam Goong. It’s also super healthy, and a great choice if you feel like you’re coming down with a cold or the flu. In Thailand you can pretty much bet that where there’s people eating on the street, Gai Yang is somewhere nearby—such is the popularity of this Isaan favorite. Its attention is well-deserved, as chicken as smoky and succulent as this is hard to find anywhere. It’s usually bought from a street cart and enjoyed with tangy som-tam and sticky rice. To find the best gai yang, check out which line is the longest and wait—you won’t regret it. A famous dish from the Northeast of Thailand (Isaan), Laab is usually made by combining minced pork or chicken, onion, chilies, mint leaves, fish sauce and lime juice. Toasted rice is added at the end for a bit of crunch, and if you’re lucky you may find a few pieces of liver tossed in as well. Laab is packed with warm, savory, sweet and sour flavors, and is delicious when paired with sticky rice and raw vegetables like cabbage and green beans. Perhaps the most popular Thai vegetable, eating ‘Pak Boong,’ may be a new experience for many, as it looks and tastes a bit like fried spinach stems. It’s usually fried with garlic, chili, and oyster sauce. The result, which is usually enjoyed with steamed rice and a main dish, is quite tasty! Vegetarians beware—sometimes pork bits are added to this dish, so be sure to order it without. Every Thai knows that Gai Pad Met Ma Muang is a favorite dish of tourists, due to its mild, sweet and salty taste. A delicious mix of chicken, onions, dried chilies, and cashew nuts fried together in a hot oiled wok, topped with a salty sweet sauce, this dish makes the perfect comfort food for the times when you can’t take any more spice or fishiness! This staple salad of many western Thai restaurants is even more delicious in Thailand! Traditional Thai som tam is made by pounding all of the ingredients together with a mortar and pestle, which really brings out the flavors. These ingredients are numerous, and include garlic, chilies, fish sauce, peanuts, dried shrimp, tomatoes, sugar, lime juice, green beans, peanuts and of course, grated sour green papaya. Som tam is made many different ways, so if you’re feeling adventurous, try som tam boo (papaya salad with crab), som tam khai khem (som tam with salted egg), or, the fishy, northeastern favorite: som tam plah lah (fermented fish). For the most authentic culinary experience, som tam should always be eaten with sticky rice. Kao Moo Dang is another common street food that’s good for those days you want something hearty and filling, but mild in taste. The dish is comprised of sweet, thinly sliced pork, a few pieces of Thai sausage and a half a boiled egg on top of a mound of rice, which is then covered in a sweet, BBQ like gravy. For a savory variation of this dish, try its delicious egg noodle equivalent: bummi moo dang. These two dishes will often be sold at the same stalls. Nam Neung is the Thai version of Vietnamese spring rolls, and can be found at the many Vietnamese-style stalls and restaurants in Thailand. These DIY wraps usually include garlic, sour mango, cucumber, mint, cilantro, and chopped up sweet pork, which you wrap up in a thin rice sheet and dip in a sweet and spicy sauce, triggering an unstoppable explosion of tasty goodness in your mouth. One of the tastiest and most popular of the Thai curries, Massaman is a sweet, tangy concoction which originated from Southern Thailand as a Muslim dish. It usually contains chicken or beef, coconut milk, potatoes, roasted peanuts, bay leaves, sugar, cinnamon, and tamarind sauce. Look for a thick, orange colored sauce containing large chunks of potato and enjoy it over rice. The Thai take on a salad, ‘Yam’ dishes are indeed some of the yummiest Thai foods you’ll find. They usually consist of at least one meat or protein tossed with lemon juice, sugar, parsley, cilantro, mint, lettuce, sweet onions and chilies. The word ‘yam’ actually describes the famous sweet, sour, and spicy flavors of the sauce that dresses these dishes. There are a wide variety of ‘yam’ salads eaten in Thailand, a few favorites include Yam Wun Sen (glass noodle salad), Yam Kai Dao (Fried Egg Salad) and Yam Tua Plu (Wingbean Salad). Moo Satay is so good that after tasting it, you’ll want to keep going back for more of its juicy, peanuty goodness instead of trying other Thai food. This delicious dish is made from thinly sliced pork marinated in turmeric and coconut milk, cooked over a charcoal grill and served with a thick peanut sauce and a sweet, vinegary cucumber salad. Order more than you think you need—you’ll be surprised at how many of these you’ll want to eat. Eaten daily by many Thais, Pad Ka Phrao is essentially the default dish that locals will order when they can’t decide what to eat—because it’s always delicious! Usually made with chicken or pork, the meat is stir fried with garlic, chilies, green onions, small green beans and Thai basil—the tasty star of the dish from which it gets its name. It’s usually topped with a fried egg and eaten over rice. Another comfort food almost universally adored by Thais. This simple chicken and rice dish is a great choice for days when your stomach or taste buds need a break from those robust Thai flavors, a.k.a when you can’t eat any more spicy food. This dish features tender, chopped chicken, which is served over rice cooked in the fatty chicken stock, usually with salty chicken soup on the side. Some stands offer the choice of fried chicken with sweet sauce along with the traditional boiled chicken. A one of a kind combination of catfish deep fried until all that’s left is crispy bits, sour mango, chili, peanuts, red onion, cilantro and Thailand’s famous sweet and sour “yam” sauce. Once you try this dish you will not be able to eat it only once. If you want to experience the fantastic and unique flavors and textures of Thai food in one dish, eat this one! This simple Thai staple may appear unexciting, but once you try the combination of rice, wok-fried with meat, egg, vegetables, green onions, garlic and fish sauce, you’ll understand why it’s the original Thai comfort food. For a Western twist, try Thai favorite: ‘American Fried Rice’—the Thai interpretation of USian food—which features mini hot dogs, a fried egg and ketchup. If you smell a strangely sweet combination of armpits, dirty feet and onion, look around for this wildly popular yellow fruit, the smell of which is so strong that it’s banned in many forms of public transportation all over Southeast Asia. If you’re feeling brave, try a bite of its thick, custardy flesh, which many consider to be a delicacy. If you want to get a taste of durian, but aren’t ready to try the fruit itself, you can also find durian ice cream, shakes, cake and chips in Thailand. Thais and foreigners alike can’t get enough of this classic and delicious Thai treat, which features a ripe, sweet yellow mango placed atop bed of sticky rice, capped with a dollop of coconut cream—or sometimes, spiked with condensed milk. This dish is freshest, cheapest, and easiest to find during Thailand’s Mango season, which is usually from April to May. Laab moo’s heartier cousin, nam tok moo contains the same flavors and ingredients as laab: pork, mint leaves, chilies, onions, lime juice, fish sauce, and toasted rice, but the meat is cut a bit thicker, making it a juicier and slightly more savory choice. Nam Tok actually means waterfall in Thai, as the dish was named after the waterfall like sound this saucy dish makes as it’s being cooked up. Eat it with sticky rice! Without a doubt, if a poll were taken to find out Thais’ favorite food, Tom Yum Goong would come out on top. There’s even a popular romantic comedy named after the dish! The soup, which is overflowing with shrimp, mushrooms, tomatoes, lemongrass, galangal and kaffir lime leaves, is thought to perfectly fuse the 5 main flavors of Thai food in one delicious bowl. It can be ordered with coconut milk for a sweet and thick broth, or without for a tangier, lower calorie soup. Be sure to give it a try and find out yourself why Thais are so crazy about it! There are way more than 25 delicious Thai dishes to be found in Thailand, but these are definitely some of the local favorites. If you’re planning a trip to any of the major cities in Thailand, the best way to sample all the different food is by joining an organized food tour. These are all some great Thai food selections– I’m definitely hungry after reading this post. Pad See Ew and Khao Soi are probably my favorites. If you’re looking to have a more hands on experience with Thai food you can check out the numerous cooking classes that are available throughout Thailand, specifically in Bangkok and Chiang Mai. This way, you can take these recipes home with you! Thailand has some of the most amazing food on the planet! Plus, half of the time, you can get it at street stalls for roughly $2 per meal. In my opinion, some of the best street food I found was in Chiang Mai and Pai. Both cities have great night food markets, so definitely check them out when you’re hungry after a long day of trekking. I still will never understand people who like durian, but to each their own! That was a good list, though I would still have included pad thai as it is really one of the best foods ever 😉 i personally like durian and tom yam soup! Thai fried rice seems a little too dry and bland for me compared to Philippine fried rice. I think the only reason I visit Thailand now is to eat their food. It is really good! I highly recommend Som Tam, the green papaya salad. I usually ordered it really spicy. The combination of sour and spicy was really wonderful. Anyway, I also recommend to try their fried chicken (that the vendors sell), it can be either really good or salty. Mango with sticky rice is especially wonderful, it is a bit of unusual pairing, but the majority of people really love the traditional snack. Thai food is one of the most delicious in the world! I like Tom Yam (its different in different places), Khao Soi (very special taste), all dishes with seafood, Mussaman Curry (the best one). Still do not understand combination of sticky rice and mango, for me its something weird. Durian by the way is very special, people don’t like it because of its smell, but the taste is good.